On reaching Bhawan, buy Prasad and other offerings. Show the Yatra Ticket at the office and collect the Token No., and check the group No. and time for your turn. The group number is allotted at the Yatra Slip Counter located on the left hand side immediately after the luggage check post. This group number would then determine the sequence in which the yatries would have the Holy Darshan and the time till they would have to wait before obtaining Darshans. 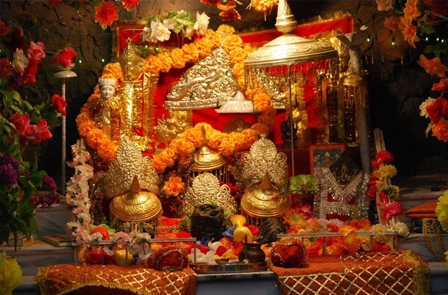 As has already been mentioned, the Holy Darshans in the Cave of Shri Mata Vaishno Devi Ji are in the form of natural rock formation called Pindies with no idols or statues. Due to the narrowness of the Cave and restriction on the number of people being able to pray inside the Cave at any given point of time, Darshans are regulated through a continuously moving queue. Yatries are grouped into batches of 200 each depending on their time of arrival at the grouping counter at Bhawan and each group is called one by one to enter into the Darshan Queue. The group which is having Darshans at any given point of time is called the current group and the number of groups in between the current group and the group number allotted to the yatri will determine the time for which the yatries shall have to wait before having Darshans. On ordinary days or days of moderate rush, yatries can have Darshans almost immediately after reaching Bhawan. 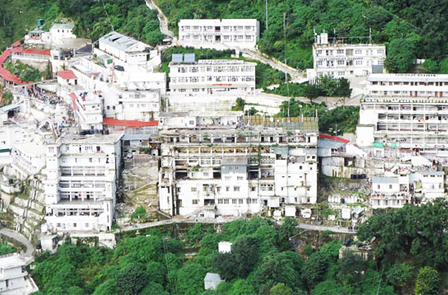 However, on days of heavy rush, especially during the peak months, one may have to wait for 9-10 hours before one’s group number is called out for Darshans. In any case, irrespective of the rush, one must obtain the group number immediately after reaching Bhawan. Most pilgrims prefer to take a bath before proceeding for Darshans. In the olden days pilgrims used to take a bath at the Bathing Ghat, with the water that flows from the feet of Mata. Immediately after a pilgrim’s group number is called or displayed, he/she is ushered in through Gate No.1 into the queue complex. The queue complex is a long corridor which opens first into two large waiting halls, one after the other and finally opens at the mouth of the Holy Cave. During ordinary days a pilgrim can enter Gate No.1 and upon crossing the required distance can reach the Sanctum Sanctorum in no time. But on days of heavy rush, one may have to wait inside the railings or the waiting room for some time before the queue ahead gets cleared. Instead, at a designated point in the main waiting hall, pilgrims have to deposit their coconuts to the temple priests who then take responsibility for the rituals. The pilgrim is handed over a token and the offered coconuts can be reclaimed after Darshans upon producing the token at the Coconut Prashad Counter. While on the way to the Sanctum Sanctorum, one crosses a small patio type of structure on the right hand side of which is a Cave opening. This is the original Cave leading to the Holy Pindies - Maha Kali, Maha Lakshmi and Maha Saraswati. In the olden days, the yatries used to reach the Sanctum Sanctorum through this cave only. Nowadays, this cave is kept closed for a large part of the year. Since this cave is quite narrow, it takes several minutes for a single person to cross it and reach the Sanctum Sanctorum. When you come out, be sure to collect an offered coconut from the other side by depositing the coconut. Therefore, two new tunnels have been utilised to facilitate a larger number of pilgrims to have Darshans. One tunnel is used for the entrance and leads directly to the Sanctum Sanctorum. The other tunnel is used for exit. The original cave is opened during the lean periods or on traditional festivals or for ritualistic occasions. Obtaining Darshans through this Cave is a different experience altogether and pilgrims desirous of enjoying this Divine Bliss are well advised to plan their trip during the lean periods only. Outside the exit tunnel and just beyond the Amrit Kund lies the Prashad counter. The blessings of the Mother Goddess in the form of Prashad pouches are handed over to the devotees by the temple priests. Each Prashad pouch comprises the Mishri Prashad plus a blessed coin, carrying the image of the Holy Pindies. In addition, Khazaana (coins) are given to the devotees. This Khazaana Prashad is believed to be a good luck coin(s) and devotees would do well to keep it in their cash boxes, temples or other important places in their homes or establishments. It is not only a belief but a fact that the Khazaana Prashad wherever kept has brought in prosperity and luck. Yatries would recollect that Coconut Prashad had been handed over by them to the temple priests in the Waiting Hall and a token had been received in lieu of it. This token is now exchange for the blessed coconut at the Coconut Prashad counter. This counter is located on the right of the exit route. It is believed that the Yatra is complete only after visiting the shrine of Bhairon while returning. Bhairon's Shrine is 2.5 km. from Bhavan. Please collect your belongings before going to the shrine, as the path of return is different. The return path is just 13 km. 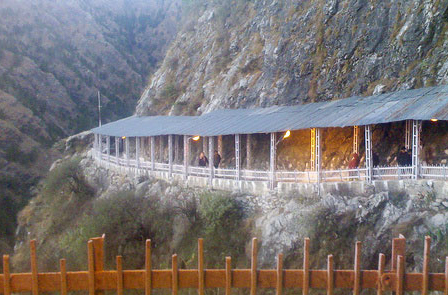 as the return path from the Bhairon Shrine joins the main path at Sanjhi Chat.